So I've decided to be adventurous this time around and make Chase's baby food myself. I figure, I'm a stay-at-home-mom, I don't have any "real" work to do (lol!) so surely I have plenty of time to create baby food from scratch, right? I had no clue where to begin. I asked a fellow blogger who happens to be very experienced with this subject, and she pointed me to this website for all the information a person could ask for when it comes to making homemade baby food. I was **this close** to starting Chase out on applesauce, only because I had a huge bag of apples that I wasn't sure LO and I would get through before they started to go bad. But we started LO on green beans when she first began solids. And I've heard the talk that you're supposed to start a baby on vegetables and work your way through veggies before offering fruit. So I resolved out of nothing less than guilt to go with the green bean plan. I didn't own a food processor. I thought I had always wanted one. They seemed to cool, so capable. So I bought one. I figured the old, plastic blender I had stowed in a cupboard for the past 5+ years wouldn't be capable of preparing baby food. The massive 8,000-cup food processor I bought was big. It had a lot of parts. It was confusing at times. But I muddled my way through, washed the bad boy and got ready to begin. I chose to steam my fresh green beans. I bought a pound of 'em for about $2.50. Once they were slightly cooled, it was time to toss 'em into the food processor. I tossed. I processed. My green beans got all chunky and sat at the bottom of the processor while the blade spun madly about 1/2 inch above said green beans. I used my spatula to move things around a bit, put the lid back on and tried again. My green beans looked awful. They were all chunky and there was nothing "pureed" about them. I was distraught! This wasn't supposed to happen! What am I doing wrong? 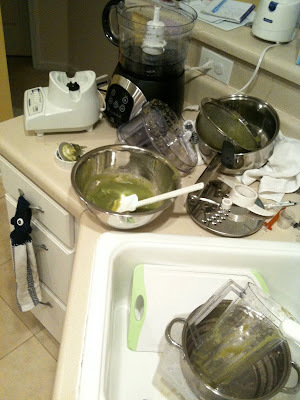 Before giving it much though, I pulled the ol' blender out of the cupboard, put my green bean chunks in it and gave it a whirl. Wouldn't ya know I started to see beautifully processed and pureed green beans, that which Gerber would be jealous of? I added some of the liquid from the steaming to get the consistency I wanted and BAM! I ended up with lovely green bean baby food! Yay! Disregard the fact that my kitchen turned upside-down and was a total nightmare. Honest. Next, I placed the green bean puree into my ice cube tray. How perfect (yet somewhat defeating) that it completely filled ONE ice cube tray. 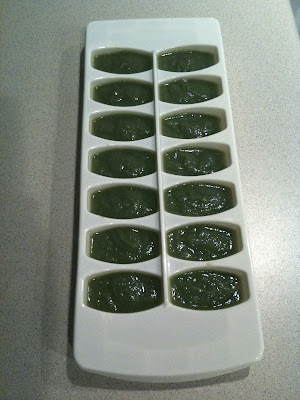 Yes, one pound of green beans equals 12 approximately 1-ounce cubes of baby food. I think I was expecting so much more for all my trouble (and my husband's trouble since I put him in charge of kitchen clean-up!). I got over it and popped the tray in the freezer (side note: I bought the OXO brand trays that come with a lid so I didn't have to worry about messing with parchment paper or foil, which could leave foil pieces in the food). Turns out right now, my little guy will only eat about 1/2 to 1 cube at each feeding, so these cubes have gone a long way already! I was going to do a cost-basis analysis to see how this compares to buying baby food (about $1.09 for two 2.5-ounce packs) but honestly the numbers gave me a headache and I decided against it. All I know is I enjoyed this process (more so figuring out what works and what doesn't) and I especially love the fact that I know exactly what went into my son's baby food. And there's a sense of pride in all of that. So I guess I'll keep on with this! I might jump into squash next (as I have NO IDEA how to make/find peas, unless I buy them frozen), then on to carrots, sweet potatoes and then fruit! Yay! 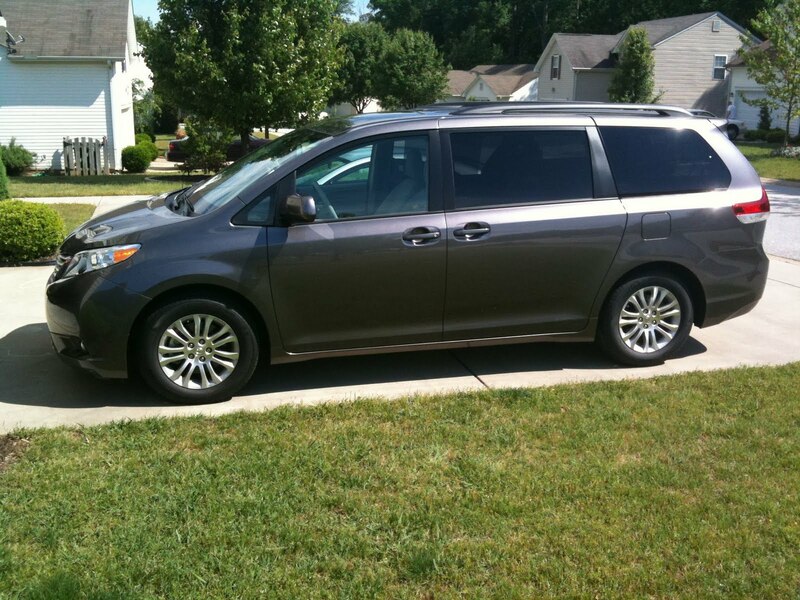 We purchased this beautiful 2011 Toyota Sienna XLE and, as much as I hate to admit it, I. Absolutely. Love. It. It honestly looked the least "minivan-y" of the options we looked at, in my opinion anyway. Our Jeep Grand Cherokee just wasn't cutting it anymore with TWO kids, their car seats and all their miscellaneous junk, so we decided it was time. We also scoped out bigger SUVs as well, but none of them had the features and space we needed for a price we were comfortable with. The first minivan we test drove was the 2010 Honda Odyssey, but honestly? Hubs and I HATED it! It totally drove like a minivan (shocker, right?) and was just so... I dunno. It wasn't for us. There are 80 gazillion of them out on the roads today, so obviously there are a lot of Odyssey fans out there, but that just doesn't include us. Then I happened to see a cute commercial for the new 2011 Toyota Sienna. You know, the ones with that crazy couple with their two kids? They call it their "swagger wagon?" You can check out their silly commercials here. Anyway, I decided that we'd test drive one more minivan before completely closing the door. Hubs and I both Fell. In. Love. It was crazy! This thing (the Limited, of course) drove like a dream! We both agreed it drove like a luxury crossover more than a minivan. We both loved the body style... not overly minivan-y since the front hood doesn't come to a point and drop off into an abyss. We were sold. After haggling with a few local dealerships, we ended up making our purchase last Tuesday. I'm so in love! The dual power sliding side doors. The power lift gate. The heated seats. The XM radio. The sunroof. The leather. The captain's chairs for the kids. The LATCH anchors for the car seats. The fold and stow 3rd row. The beautiful predawn gray mica color. The DVD player with wireless headphones. The tri-zone automatic climate control. The bluetooth for making/receiving phone calls and listening to the music from my iPhone wirelessly. I could go on and on and on! There's so much to love about this vehicle! So while I still somewhat hate the fact that hubs and I had to officially enter into parenthood with the rite of passage known as a minivan purchase, I'm still totally stoked about this baby! I can't wait to break it in on our upcoming family road trip! Chase loves his Jumperoo! Here's a short clip of him playing this morning. 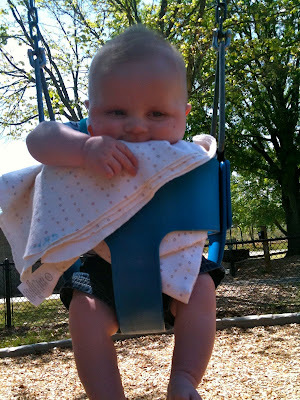 His sister loved this thing like crazy when she was a baby, and he's definitely following in her footsteps! It's so cute to watch him jump and play with the toys! I'll rotate his seat around for him occasionally and he'll see all the "new" toys and get so excited to play with them! Happy Sweet 6-Month Birthday to my sweet baby boy! 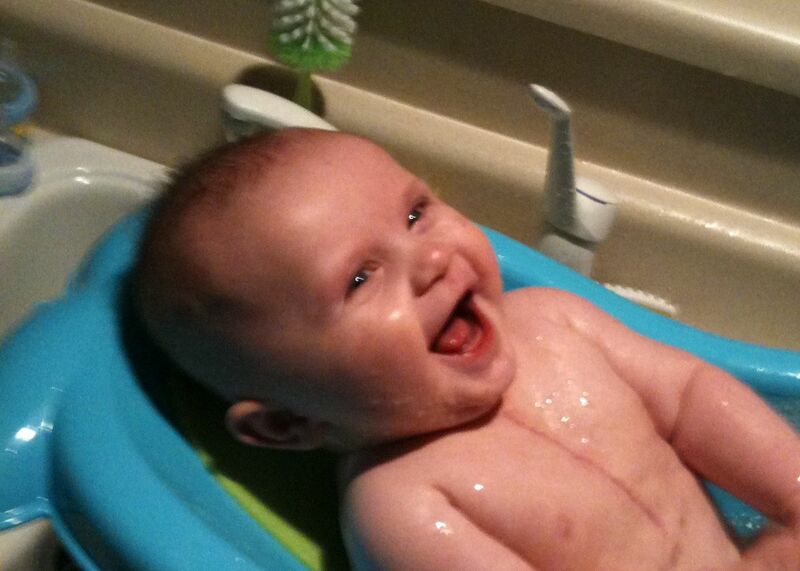 Our lives changed forever 6 months ago today. Our precious little miracle was born and we have been so blessed! Chase is really starting to develop quite the little personality! 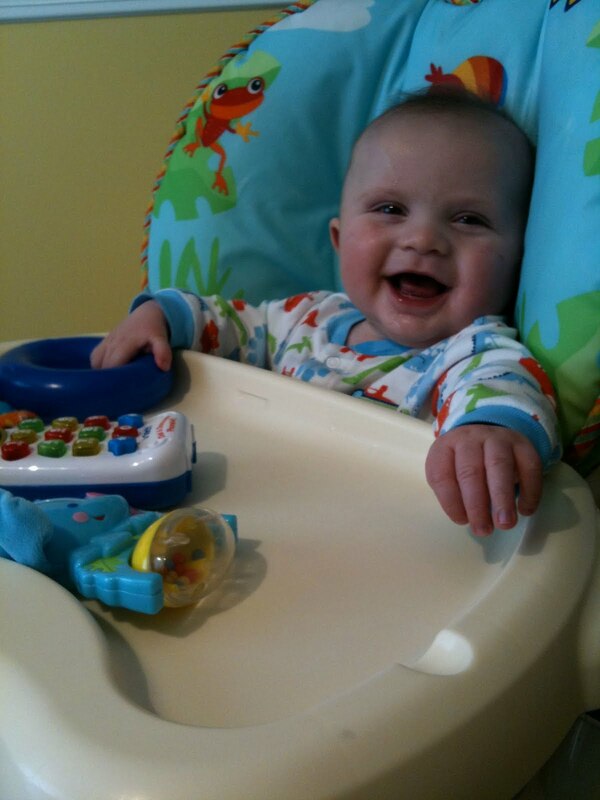 He's ALWAYS happy and smiling (unless he's tired, hungry or needs to be changed). He is quite possibly the sweetest, kindest, most genuine tiny little person in the world! 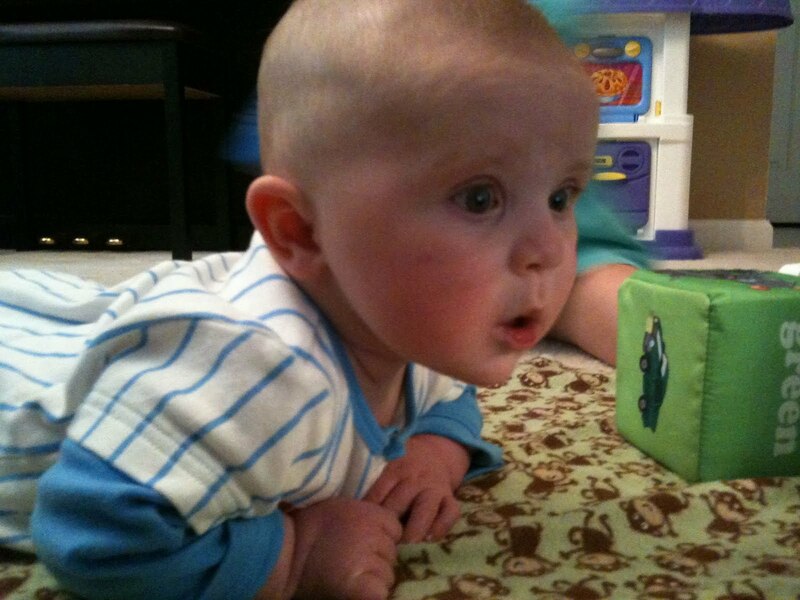 I thank God every day for bringing this boy into our family. I can't imagine life without him. I pray daily that God will continue to keep His hand on him and help him to grow stronger and stay healthy each and every day. Here are some recent pics and a little video clip of my precious little Chase. Enjoy!